A few years back, I fell fully and completely down the ice fishing rabbit hole. Every Saturday morning my buddy Colby and I loaded up the truck, grabbed a cup of coffee, and trundled off in search of a hard deck and hungry trout. We usually caught fish, though Colby had a knack for reeling up chubs instead of trout. I don’t ice fish as much these days – winter fly fishing and skiing occupy my time – but seeing as Colby and I taught ourselves to ice fish, I reckon I learned a few tips and tricks, albeit the hard way. I’m by no means an expert, but fish are fish and they all act with a certain degree of predictability, whether they’re in a river or beneath a hole in the ice. Yeah, you need a good ice fishing tent, especially when it’s -10 outside. But that’s not the kind of structure to focus on. Instead, you need to make sure you’re fishing around or near structure within the lake. If you don’t have a fish finder, or other sonar device, this gets tricky. Prior knowledge of the lake helps you find the structure that always holds fish. That’s not always possible, though. The first time I ever fished at Fish Lake here in Utah was when a foot and a half of ice capped it. It was a predictably terrible day on the hard deck. If you find yourself in a similar situation – on the ice with no prior knowledge of what lies beneath – there are a few tricks to put yourself near structure, at the very least. First off, finding points where the shore juts out and creates bays on either side, is pretty close to a sure thing. As my buddy Hyrum says, all the fish in the lake have to swim around a point eventually. Fishing off one puts you in the middle of the path of fish, if they’re on the move. Luckily, even during winter, trout tend to move in schools, so this method works well. Another way to find structure is looking at the shoreline. Often, if a portion of the shoreline is big piles of boulders, that structure doesn’t end at the lake’s surface. Any visible structure on the shoreline will generally create something fishy beneath it, so these are good places to check as well. Aside from rock piles, trees are great too. Their roots often spread out beneath the water’s surface, creating an obvious area of perfect fish habitat. Look for either large, lone pines, or big stands of smaller trees. 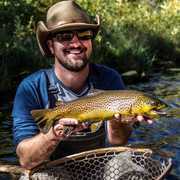 Perhaps this is the fly fisherman in me, but I have a hard time deriving entertainment from dunking a worm and waiting for my rod tip to bounce. Some folks get all the thrill they need out of that, and that’s awesome. But it bores the hell out of me, and it’s not always the most effective way to catch fish through the ice. Gitzit jigs are my personal favorite for ice fishing. They’re cheap, effective, and the hook quality tends to be better than average. Plus, the jigs – even the smaller sizes – have plenty of room for spearing worms, sucker meat, or any live/dead/frozen bait of choice. Don’t overlook larger black marabou jigs, either, especially if the lake you’re fishing is known for its leech population. If you’re not sure what the forage base is, any leech imitation is a fairly sure bet. Lastly, don’t forget big spoons or Kastmaster-style lures. Jigging these lures creates a ton of “noise” in the water that fish feel along their lateral line. Since fish aren’t as active in winter – thanks to a slower metabolism – anything you can do to alert fish to the presence of your lure and bait gives you an advantage. If fishing has one absolute, cardinal rule, it’s that you don’t leave fish to find fish. But what if you can’t find the fish? Don’t be afraid to move around and try as many different spots on the lake that look “fishy.” I’m a fly fisherman first and foremost, so constant movement while fishing is engrained in my angling habits. That’s not the case for all anglers, but it’s a necessity for fishing the hard deck. Tons of anglers I know spend the year planning for ice fishing season, and each time I tag along with one of my die-hard buddies, I see them employ these same simple techniques. Just like any other form of fishing, success in ice fishing comes from doing the simple things correctly.